The framework/canvas is presented below, with a discussion on the meaning behind each "building block" afterward. A printable PDF can be requested by emailing: [email protected]. To use it, you can start with your "Mission" and then work from left to right. 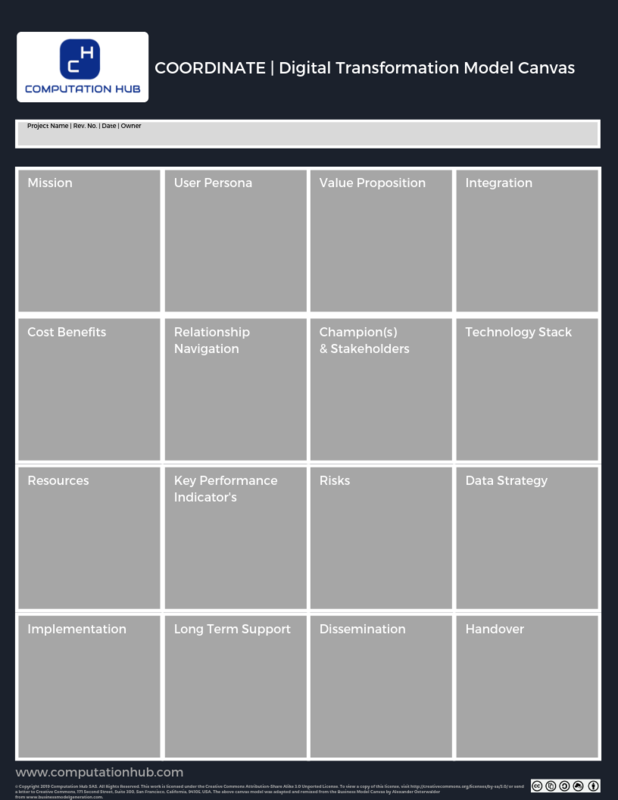 16 building blocks are proposed which form the strategy for your Digital Transformation project. These blocks are discussed below. A short motivational statement that underpins your project. It acts as your point of reference to keep a laser focus on the desired end goal. Core values could also be included. Decision's you'll make should relate to this statement and core values. Realistically, you should be looking to cannibalize an existing user workflow - even if it's as young as 12 months old, for example. Identifying what you are going to offer and what benefits the user can experience with your solution is very important. This is because it will help you get "buy-in" from the user themselves and upper management. What is the value-added that this project would bring? Face-to-face meetings with your target audience to identify this is quite valuable. People work in routines. They hate change. So, you've designed, built, tested your new app. It's deployed. You wait for feedback but discover your target users haven't opened the new app. The problem is that your tool does not appear in the user's workflow loop. You need to find a way to "hack" or become integrated into this loop. A high-level analysis of the various costs and associated benefits that you aim to achieve can help your mission. The analysis should consider if you are going to execute the project with your own team or outsource the project. There may be hidden benefits that are unforeseen at this stage, so make the best, logical guess you can. Potentially, you'll have to deal with half a dozen departments to get your project started. You'll likely need to search for approvals, permissions, and support, amongst other things. Consequently, you may have to deal with cultural aspects too - age difference, language and companies' "ways of doing things". Apart from you, the project owner, who else will support your project? Who will act as a mentor in times of crisis and success? These people will be those that support your initiative and help achieve "buy-in" from employees within the organization. Stakeholders are also part of this task. Can't find anybody? Reach out to someone or ask for a recommendation from a colleague. A brief overview of the technology stack you might require. Are you going to host your new app or service in the public cloud or host internally? What technologies will you choose? Do you have adequate resources in-house? Will your technology choice be derived from the resources you have on-hand? This block can be revised once you understand what resources you'll use. health and safety teams etc. Return on investment is the most common metric you're going to be asked by upper management. This is very difficult to estimate for digital transformation projects. In many cases, you can't put a figure on it. Obviously, this is not what managers want to hear. So, you'll most likely start with a Minimum Viable Product (MVP) which can exist in many forms (Mockups, a stripped down version of your software tool etc.) to show what it would look like. This may be used to get a starting point for evaluating KPI's, obtaining the green light and moving your project to the next step. Risks are part of any project. Don't be afraid to talk about them and understand them with your colleagues. One of your roles is to act as a "risk mitigation manager". One could also ponder, what risks are imposed on the organization by not undertaking a digital project? Will your project be a data consumer or data generator? A data management strategy will likely need to be defined to ensure that data is handled effectively to benefit the organization. Consultations with Digital, Data and Legal officers within your organization is quite necessary. This block is the execution and implementation of your project plan. This involves common project management techniques. Ideally, the philosophy you'll follow will be Agile and short, fast sprints to evaluate your solution. Building a software tool or rethinking a process to make your colleagues lives easier can be a rewarding yet challenging experience. Therefore, it would be a shame if you stopped after the project is delivered. How do you keep a digital project alive, active and perhaps growing? Security maintenance, addressing feature requests etc are inevitable. Is there a plan in place? How is the good news going to be spread across your organization about what you've achieved? This could be via an intranet posting, email communication from one of your champions (Company CXO). Are there lessons learned that could benefit your organization in the future? List them here. Congratulations. Your project has been completed. Everyone loves it. Do you continue as the project champion? Who will assume management and oversight if you move departments or company? Nominating one of your project champions could be a solution. We believe in open collaboration and dialogue. Contact us with any feedback or comments. Are you thinking about using this framework? Let us know!